Many families rely on their tax refunds to pay for major expenses and essentials, but with delayed refunds for millions of households for up to a month this year. For people who need that money to pay for medical expenses or necessary car repairs, that’s a huge problem. Many will take out a tax refund loan to fill the gap. The refund loan products are relatively new. Consumers must dig into the details to understand what kind of loan they might expect and exactly what’s being offered. The advance loans are made by banks — and secured by and repaid directly from a consumer’s tax refund. As a result, the size of the loans will be limited. So if you’re owed a $3,000 tax refund, there’s no way you’re getting a $3,000 refund advance loan. Yet the big number is what consumers will see first. H&R Block has a product that promises up to $3,000 — If approved, H&R Block says, clients will typically have access to money the same day they apply. Jackson Hewitt has a product that promises up to $3,200 — up from a maximum of $1,300 last year — for a 0% interest loan. 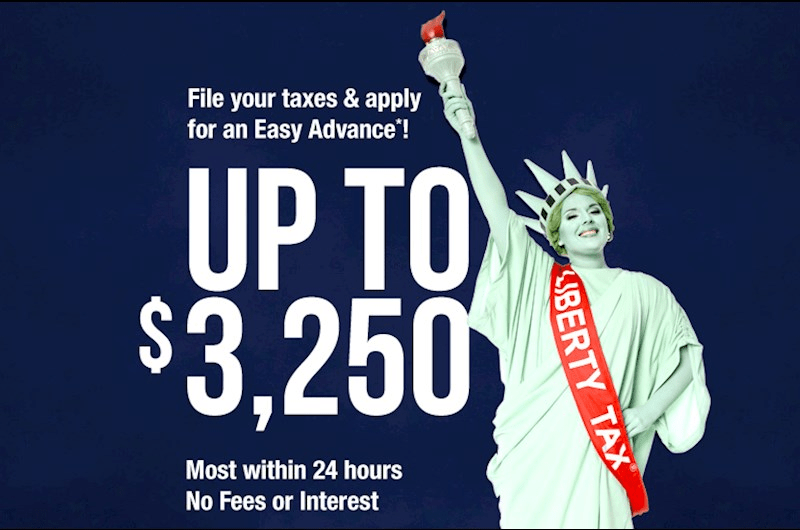 Liberty Tax is promoting what it calls “the largest tax refund advance offer in the industry” with its Easy Advance Loan of up to $3,250 now through Feb. 28. No fees or interest are associated with the loan. TaxSlayer, an online tax service, launched what it calls “RefundNOW,” where qualifying customers can receive an advance of up to $1,000 in as little as 48 hours of their e-file being accepted by the Internal Revenue Service. Loan amounts are either $500 or $1,000. Credit Karma Tax announced the launch of Earlybird Advance, where qualifying customers can receive an advance of up to $1,000 with no fees or interest with an American Express Serve Prepaid Card in as little as 24 hours of their e-file being accepted by the Internal Revenue Service. Loan amounts are either $500 or $1,000 and processed through Meta Bank. Tax refunds, of course, can be the single biggest financial payout for many consumers each year. The demand for refund advance loans is being driven up after a crackdown to combat tax refund fraud. The Internal Revenue Service is now required to hold back some tax refunds until at least mid-February for those claiming the Earned Income Tax Credit or the Additional Child Tax Credit. Last year, about 15 million people who filed early in the season faced those delays. The IRS warns tax filers that refunds that include such credits will not show up in a taxpayer’s bank account or debit card until at least Feb. 27 for those choosing direct deposit. But more delays could take place if there are other issues with the tax return. An important point: The delay applies to the entire refund, not just the portion of refund money that’s associated with these credits. So the IRS advises consumers not to bank on getting a refund by a certain date, especially when making major purchases or paying bills. 1) Everyone isn’t getting a 0% loan of $3,000 or so. Liberty Tax, for example, notes that to be eligible for the maximum $3,250 loan amount, you’d need an expected federal income tax refund — minus authorized fees for tax preparation services — that amounts to at least $5,095. The available loan amounts at Liberty Tax are $500, $800, $1,300, and $3,250. The actual loan amount will vary based on the expected refund amount, ID verification, eligibility criteria and underwriting. The refund advance loans at H&R Block are in four different amounts — $500, $750, $1,250 or $3,000 — depending on what you’re qualified to receive. H&R Block said a client needs to be due a federal income tax refund of at least $1,000 to be eligible for a Refund Advance and meet underwriting criteria. The average federal income tax refund last year, according to the IRS, was $2,782. Jackson Hewitt customers can get loans available in amounts of $100, $200, $500, $750, $1,000 or $3,200. The advance loan is offered to Jackson Hewitt clients by MetaBank in Sioux Falls, S.D. MetaBank said it will make up to $750 million in interest-free refund advance loans in 2017, up from the available $450 million last year. A spokesperson for MetaBank said the bank works to provide the highest loan amount possible, and in many cases, the loan amounts are more than 50% of the refund due. Jackson Hewitt’s website allows people to answer some questions to see how much money they might pre-qualify to get a loan. See www.myrefundadvance.com/prequalify. H&R Block’s site also has a form for determining what kind of loan you might get. See www.hrblock.com/offers/refund-advance. The refund advance loan is offered to H&R Block clients by BofI Federal Bank in San Diego. The loan at Liberty Tax is offered by Republic Bank & Trust Company, based in Louisville, Ky.
2) You cannot go online to get many of these advances. You’re going to need to visit a tax professional and have your taxes prepared at a participating H&R Block, Jackson Hewitt or Liberty office to obtain any of these loans. Jackson Hewitt also has tax preparation offices in Wal-Mart stores, too. TaxSlayer is offering an online advance for a small amount where the maximum loan amount is $1,000 — not up to $3,000 or so. Customers must have a W-2, as well as a valid and current government-issued photo identification and meet other eligibility requirements. 3) No fee does not equal no cost. With zero percent interest and no fees, these are low-risk loans compared to refund anticipation loans (RALs) available in previous years. Remember nothing is ever free and to get these loans, you must pay the high filing fees to file your taxes through the company offering the loan. This is unnecessary since the loan doesn’t provide you your tax refund any quicker, and you can get your taxes done for free by filing your own taxes online or at MyFreeTaxes.com. Before you take out any loans make sure you understand all the tax preparations fees that apply and make sure that you are charged the same price as if you were walking in to file a tax return. sometimes they will use a higher rate scale for preparations fees to make their money back on the loan. H&R Block notes that you can file a federal 1040 EZ for free beginning Friday, January 5, 2018, through Feb. 28. But many people cannot file the EZ form. For example, you cannot file an EZ if you claim dependents. And you cannot file the EZ form if you claim any credits other than the earned income credit. And H&R Block notes that additional fees apply for the Earned Income Credit and certain other additional forms, for state and local returns, and if you select other products and services. Don’t forget there are now plenty of ways for many people to file a tax return without paying a charge. Free File tax software, for example, will be available at www.irs.gov for many households with incomes less than $66,000. Some lower- and moderate-income consumers could end up paying for tax preparation services simply to get one of these advance loans even when they might qualify for free tax services via volunteer sites, such as My Free Taxes. The National Consumer Law Center, said some mystery shopping tests have shown that tax preparation fees can be $400 to $500 for some lower or moderate-income taxpayers who qualify for the Earned Income Tax Credit. The tax preparation fees typically are taken out of your refund when you take out a refund advance loan. 4) Is this really a way to get same-day cash? Jackson Hewitt says the refund advance money is available within minutes to 24 hours of completing a tax return with Jackson Hewitt if the money is loaded on the American Express Serve prepaid card. It’s often one hour. But you do have to watch for any fees associated with using a prepaid card. If you choose direct deposit into your bank, the money could be available within one to three days. The loan is automatically repaid once the tax refund is received. 5) Is everyone eligible for an advance? Not Everyone is eligible, each company has their own criteria for issuing advance loans. They will need to verify your identity, evaluate the risk of offering you a loan, and assess other factors. Although some companies see if you’re eligible for a loan before filing your taxes, some don’t tell you if you qualify until after paying for tax preparation. Why pay when you can get your taxes done for free? Impact on credit score: Reputable companies that offer tax loans without high fees or interest rates have some drawbacks, as well. Like a traditional loan, consumers have to apply for a tax refund loan and the lender has to approve them. A tax refund loan has the potential to significantly lower your credit score. If you miss a single payment on these loans, your credit score will ultimately be impacted negatively, and this will hurt you in the long run. 6) Do you need to rush? The IRS announced that the tax filing season will kick off Jan. 29 – which is about a week later than last year. The filing deadline is April 17. Many software companies and tax professionals will accept tax returns before Jan. 29 but they will only be able to submit the returns to the IRS beginning the last Monday in January. The IRS won’t process paper returns until later in mid-February. The IRS said it anticipated issuing more than nine out of 10 refunds in less than 21 days. So when it comes to a refund advance, do you really need to rush? Remember when applying for these 0% tax refund loans that you are essentially paying to receive your refund a few weeks earlier than planned. And sometimes you can pay as much as 10 to 20 percent of the total refund amount, and if you are not careful with your repayment schedule, you may even end up spending upwards of 60 percent of your refund on the cost of the loan. In many cases, waiting only a few days or weeks can save hundreds of dollars. The best move is to be patient and have the IRS send your tax refund directly to you free of charge, so you get 100 percent of what the IRS owes you. If you decide to go with the tax refund advance offer, make sure you read the fine print and check the dates. Each company has a different policy. Here’s a link to a more detailed explanation from Consumer Reports.